Nestled just a few miles off the northern shore of Venezuela, but uniquely it's own, lies the beautiful Dutch island of Curaçao. It's the largest island of the Netherlands Antilles and is host to some 170,000 inhabitants from some 50 diverse cultures. Curaçao is easily accessible from Miami (a couple of hours) and Caracas and there are also many transcontinental flights from Europe. 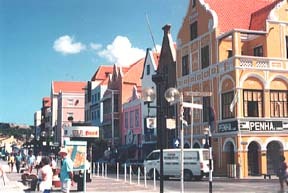 As you can see, Curaçao is well developed and we were soon to find out, it had its own little charm. In the distance we could see the smoke from the oil refinery. As you know, Venezuela has rich reserves of oil and the Curaçao refinery has been producing since the 1920's. 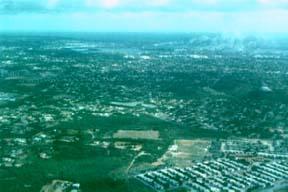 Just beyond it, St. Anna Bay where the capital and largest city, "Willemstad" lies. We were to be welcomed by close friend, and Curaçao native, Javier de Castro. 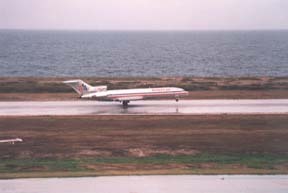 We touched down just after it had rained. Our flight from Miami is quick, seemingly over before we knew it. As we taxied to the terminal you could see a long row of windmills, generating electric power, in the distance. On the trip down over the awesome waters of the Caribbean, there were many times we could actually see the bottom of the ocean for miles and miles. Curaçao is about 800 miles north of the equator, but still below the hurricane belt. With an average temperature of 82ºF (28ºC), afternoon showers are a delight. And the island is never really "hot". Trade winds keep the island pleasant. A perfect location for...baseball? Yes! Even the Little League is World Class, coming in second this year! Javier met us at the airport. The drive from the airport through the sometimes hilly countryside to Willemstad, the capital and only city, is a beautiful contrast as we drove through the surrounding suburbia amidst the limestone and volcanic hills. This is downtown. The Penha building on the corner was built in 1708, and as you might notice, all the buildings have wonderful Dutch architecture. The clear blue skies became a daily habit for us. And the shopping downtown has to be some of the world's best. Almost every storefront here has a superb selection of fine duty free items. Even the store fronts are beautiful. It's a place where you really can step back and relax and record in your mind this wonderful row of caribbean colors and ornate work. The charm of each business is only overshadowed by the warmth of each owner standing just inside to welcome you. This is Curaçao.